Starch crops grain or roots are the basic raw materials. Also purified starch of any origin corn, wheat, potato or cassava can be used. The hydrogenation can of course begin with dextrose liquid or dry but in real life the process begins with basic raw materials like cassava, corn or wheat. The basic raw materials are cleaned and the starch is extracted in a wet milling process and then purified and concentrated to 21o Be pure starch milk. So far the process is identical to the one used for the manufacturing of native starch as the end product. Instead of drying the starch, the concentrated pure starch milk is liquefied by cooking with acid or alpha-amylase. The cooking is carried out continuously in a converter by injecting steam. A rather low DE hydrolysate is the resulting intermediate of this conversion. The hydrolysate is hydrolyzed to the very end as the monosaccharide dextrose and purified. 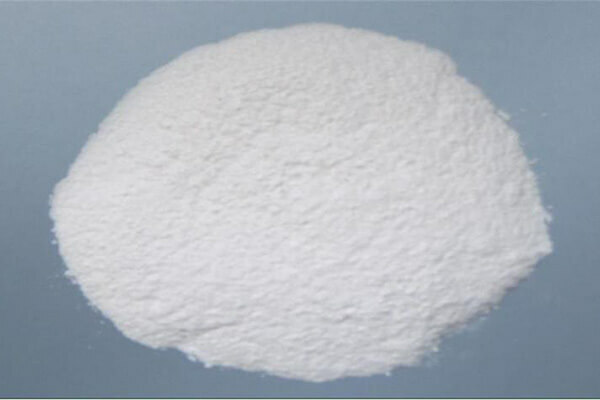 The purified fully saccharified starch solution is concentrated and is now identical to standard high DE dextrose syrup. The clear dextrose solution is hydrogenated in the presence of a catalyst in vigorously stirred reactors at specified pressure and temperature. It is necessary to safe-guard the process carefully, because of the hydrogen applied. Head space of the autoclave is flushed with nitrogen to remove air and its oxygen completely. Hydrogen is made on site. The hydrogenation is carried out intermittently in few hours cycles. 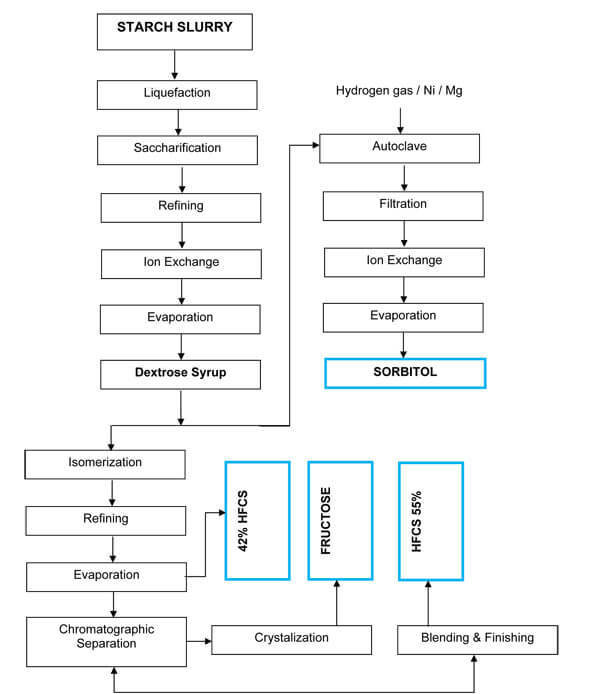 The hydrogenated solution is decanted and subsequently subjected to carbon treatment and ion exchange. The catalyst is recycled and reused. The purified solution is evaporated to 70% dry matter - the most usual concentration of Liquid Sorbitol. The syrup may be spray dried or crystallized to obtain a powder.